If you’re connected to the Internet, you have a unique identifying number known as an IP address. And it’s no different for your visitors – each and every person coming to your site similarly has their own unique IP address. With the right plugins and tools, you can work with these IP addresses to both add functionality and/or restrict access to your WordPress site. Dynamically display each user’s IP address on the front-end of your WordPress site. Block users from commenting on or accessing your site based on their IP address. Using WordPress to a show a visitor their own IP address. When might this come in useful? While you can always just use it as a fun widget, there are some practical uses as well. For example, if you’re showing code snippets where a user needs to insert their own IP address in the code snippet, you could use this technique to show visitors their IP address to save them the trouble of figuring it out themselves. Similarly, you might be giving instructions where visitors need to enter their IP address as part of the instructions. Again – this approach makes it easy for visitors to find their own IP address. While the code to create your own shortcode is actually pretty simple, there’s already a lightweight plugin called Show IP address that does exactly what you need and nothing more. To get started, search for Show IP Address in your dashboard and install the free plugin. You’re looking for the plugin from Keith Griffiths. Once installed, there’s really nothing you need to configure. As I mentioned – the plugin is incredibly lightweight – we’re literally just talking a few lines of code. 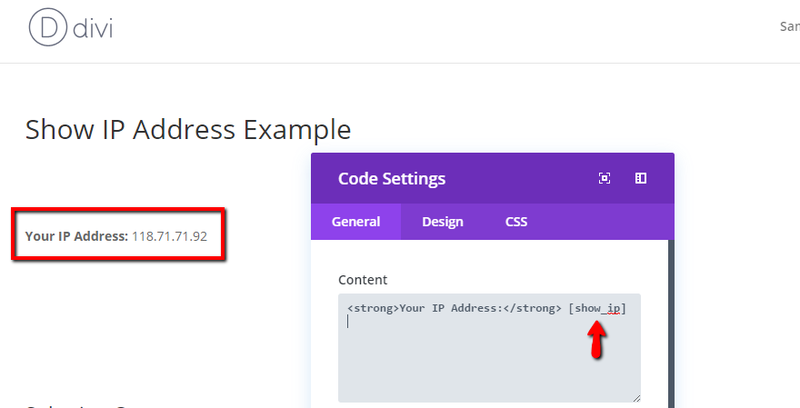 Once you activate the plugin, you can use the [show_ip] shortcode to display a user’s IP address. You can either insert this shortcode in the regular WordPress Editor or a code module in the Divi Builder. But what if, rather than showing a user their IP address, you’d rather block specific users based on their IP address(es)? Part of dealing with these problems is installing a quality security plugin. Good security plugins have security measures and firewalls that will automatically block known bad IP addresses. But you might also have a situation where you need to zero in and get rid of specific IP addresses. That’s what this section is about. If you already have the IP address(es) you want to ban – you should feel free to skip ahead to the next section. Finding IP addresses for other bad actors is a little more tricky. Unless you have a specific activity monitoring plugin, your best bet is normally to dig into your host’s logs. You can download a traffic log for each specific site that you host. Then, using something like Winzip, you can open the .gz log file. Then, open the file that’s inside the .gz file with Notepad or another text editor. At that point, you can use CTRL + F to look for people who accessed specific pages on your site. In the above screenshot, you can see that someone using Firefox tried to access my wp-login page. I should probably block them given that I use Google Chrome! Using the built-in Comment Blacklist tool. This is part of the core WordPress software. Using a plugin. As is normally the case, you can find a free WordPress plugin to help you get the job done. 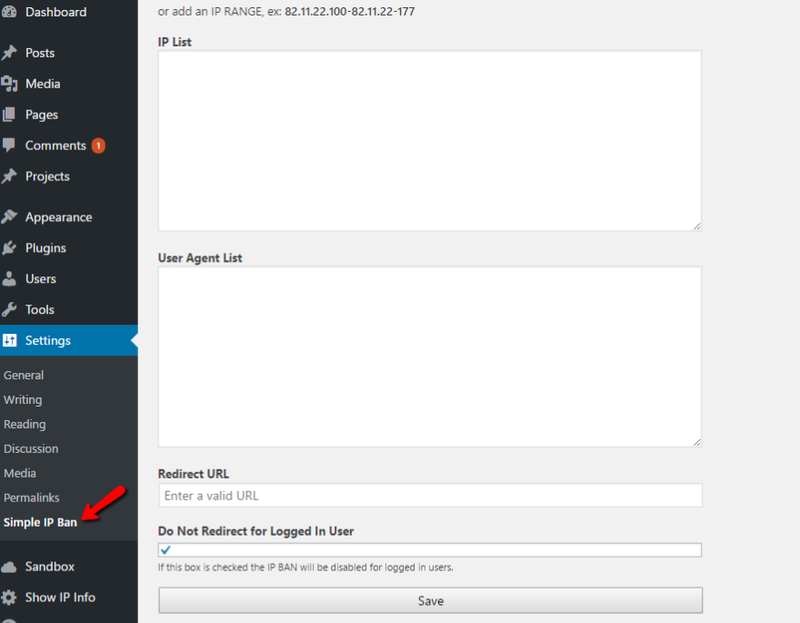 Taking advantage of cPanel’s IP Address Deny Manager. A server-side option for those who host WordPress sites on hosts using cPanel. Blocking specific IP addresses with .htaccess. Kevin covered how to do this in tip #6 of his .htaccess tips and tricks post. Because Kevin already covered the .htaccess angle, I’ll exclusively focus on the first three methods. As I mentioned – this is a core WordPress feature. So you don’t need to install any external plugins to get access to this tool. If you’d like to completely block certain IP addresses from your site, you’ll need to go a step further. One way is to use a free plugin called Simple IP Ban. Once you install and activate the plugin, you can head to Settings → Simple IP Ban to configure it. Whether you need to show users their own IP address(es) or block the IP addresses of malicious actors trying to access your site, the preceding plugins and tools can help you out. Just be aware that, on the blocking front, IP addresses don’t always stay the same. So even if you block someone once, they can come back with a new IP address. Sometimes the situation can feel a bit like a game of whack-a-mole! For that reason, it might be easiest to stick with one of the options that’s available inside your WordPress dashboard so you can quickly add new problematic IP addresses as they pop up. How do you handle displaying or blocking IP addresses on your WordPress site? Thanks for all the tips. Lately i was under attack by spammers and script kiddies and used Wordfence WordPress plugin. This plugin contains more options than Simple IP ban that are useful to fight spammers ! Manually managing IP addresses produces serious time drains. Far better to use fail2ban, which automatically blocks + unblocks IPs for various time periods, based on their behavior. Using fail2ban means you setup once + forget, whatever fail2ban recipes you’re using. Great for people focusing on generating cash, rather then bit twiddling. I use fail2ban hosting client sites, so I never even consider what IPs to allow/block.